The Prince of Wales was recently left marvelling at an innovative cancer treatment that gives patients their vital chemotherapy – through a backpack. 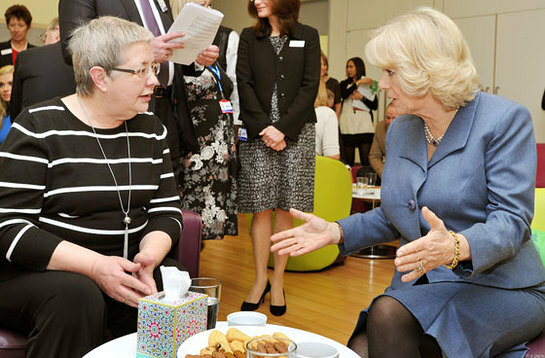 His Royal Highness learnt about the procedure during a visit with The Duchess of Cornwall to a £100 million groundbreaking centre that is leading the country in standards of care for people with the disease. Patients can visit the University College Hospital Macmillan Cancer Centre and have a chemo backpack or bum bag fitted and then go out shopping, sightseeing or just have the freedom to move around the building. Their Royal Highnesses met Chris Hemblade, who was diagnosed with lymphoma, a type of blood cancer, last November. The patient joked about the utilitarian dark blue hue of the rucksacks. The modern facility opened in April last year and with its bare concrete walls and open plan design has the feel of a stylish office block and even boasts floor murals by renowned artist Grayson Perry. It treats patients as a whole with University College Hospital staff providing conventional outpatient care on the centre’s upper floors, and at ground level Macmillan run a walk-in service for emotional support and advice alongside complementary treatments like yoga, massage and aromatherapy. 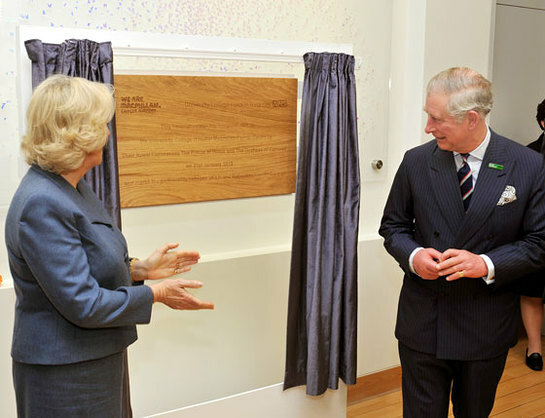 The Prince is Patron of Macmillan Cancer Support, which has collaborated with University College Hospitals NHS Foundation Trust to create the centre. He was joined for the visit by Welsh mezzo-soprano Katherine Jenkins. The singer is an ambassador for Macmillan and has personal experience of the work of its nurses as her father died of lung cancer when she was a teenager. The performer is planning to run a marathon to raise funds for the cancer charity and her sister works for its intelligence and research team. She said: "It’s kind of a family charity. When my father was sick I was 15 and my sister was 13, and the Macmillan nurses came in to take care of him and help my mother. And ever since then we’ve tried to say thank you and do our little bit. “My family last year cycled from London to Paris and my sister Laura works for Macmillan, and I’m running the marathon this year in aid of Macmillan.